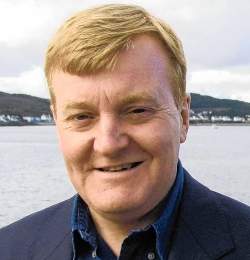 Tributes have been pouring into radio and TV stations across the length and breadth of Scotland and the wider UK today following the sad announcement of the death of former MP Charles Kennedy, aged 55. The one-time Liberal Democrats party leader and recently dislodged Ross, Skye and Lochaber MP was found dead at his home in Fort William. In a statement, Police Scotland confirmed there were no suspicious circumstances. A statement issued by Charles Kennedy's family described their "great sadness" and "enormous sense of shock". The statement added, "We are obviously devastated at the loss. Charles was a fine man, a talented politician and a loving father to his young son." The Liberal Democrats said on the party's website, "Charles was one of the greatest politicians of his generation, devoting his life to public service, having been elected as a Highlands MP at the age of 23. He was well known for his wit and charm when speaking, which touched many people beyond the world of politics. "He led the Liberal Democrats to our party's greatest electoral successes and showed immense courage when standing up against injustice, most notably when his spoke for the country against the invasion of Iraq." The media and personalities from the world of politics, business, sport and entertainment often pay little more than lip service following the death of a high-profile figure. But, in this case, almost uniquely, the tributes have been wholesome, honest and heart-felt. Charles Kennedy really was highly respected by both the man in the street and by those at the top end of society. I met him on a number of occasions while working as a reporter for the Ross-shire Journal, a weekly newspaper which covered his parliamentary constituency. And I would often talk to him over the phone at least once a week, mainly about the column which he wrote for the paper. Sometimes he would call me from the House of Commons. More often than not it would be from the departure lounge of Heathrow, or another UK airport, as he was waiting for a flight to some European capital. What always struck me was the sheer energy, honesty and integrity of the man. And no matter how busy he was, you always felt he had time for you, and that at that moment, you were the most important person on the planet. Yes, I always looked forward to reading his column, as did thousands of his constituents, because it always gave a real insight into the workings of the UK parliament, particularly if there was an issue which had a direct bearing on the Highlands. Charles Kennedy was not only a great speaker, a talented writer and a giant of a man, he really cared passionately about the area and the people he represented. He will be sadly missed by everyone.